First, there was the event at Book Expo America when I got to listen to him speak about why fiction is dangerous. Without being a bore, let me quickly walk you through it…in a nutshell: my morning was insane. We missed our train and then had PROBLEMS ON THE TRACKS mere weeks after the whole train crash debacle, and I literally RAN into Javits hoping beyond hope that I hadn’t missed my chance to hear Neil speak. My dear friends Heidi and Asheley saved a seat for me and I was so giddy from anticipation that when Neil came out, I cried real tears. The absolute awe I felt was entirely too much to handle. You see, this is the voice that got me through some incredibly rough times. The voice that allowed me to gain enough courage to drive through rush hour for the first time without becoming so frozen with fear that I had to pull over until my panic attack subsided. Reality hit and I became so overwhelmed with gratitude and utter happiness that I couldn’t contain myself. Then just three weeks later I drove three hours to Saratoga Springs to listen to Neil speak again, and this time I got to meet him. To be honest it is nearly impossible for me to explain what it feels like to meet someone so incredible and important. If you haven’t experienced it, I really can’t put the feeling into words. Basically, I listened to the wonderful man speak about his new book, and he read bits of it to us in which the beau, who drove 3 hours just to watch me react to my favorite author speak, became an instant Neil Gaiman fan. True story – he has gone through my entire Gaiman library at this point and is starting on the audiobooks. Then, and this is the best part, I got to actually meet Neil and tell him how amazing I think he is, TO HIS FACE. As you see in the picture above, there is an ongoing joke between my friend Amy and I that I need want to touch Neil’s hair, and I had every intention of reminding Neil of that tweet and informing him that I am not the kind of gal who just goes around touching people’s hair, but it didn’t all go according to plan.. Looking up and smiling, politely ignoring my flails. So yeah, overwhelming. He looked so tired and was still so charming and gracious, I could barely handle it. Then I drove the three hours home, while listening to the Evelyn, Evelyn CD we were given at the event, and became an immediate Amanda Palmer fan, so there’s that. To sum up, go hear Neil Gaiman speak at your earliest opportunity, it is an absolutely fantastic experience that I can hardly put into words. Oh and read ALL THE GAIMAN BOOKS. No, seriously. This entry was posted in Author Event, Event and tagged Amanda Palmer, author event, Authors, BEA, Book Expo America, books, music, neil gaiman, Signed. Bookmark the permalink. I love you. 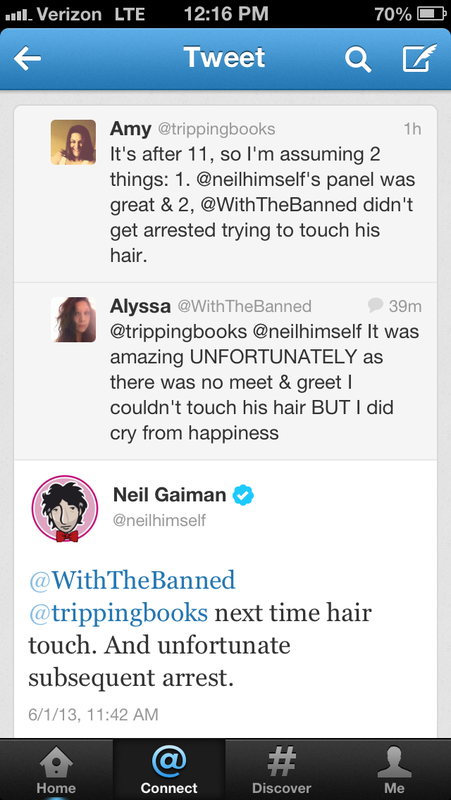 And I’m so glad that you got to meet NEIL GAIMAN, whom you love so much. I know he has so many awesome, die-hard fans, and maybe I’m biased, but he’s lucky to have a fan like you! It sounds like you had two wonderful experiences seeing him! I can only imagine having the opportunity to see one of my favorite authors and how I’d react in their presence lol. I think it’s so awesome that his works and signings are able to attract such a large following of people. I can’t say I’ve had much luck with his books personally, but I think I’ll have to give his newest a try! Ahhhhhhhhhhhhh. I’m so jealous right now. My love for Neil Gaiman is a crazy monster. I would have cried and flailed like a crazy person all over the place. He is utterly brilliant.